This TV Stand Includes Two Large Banners For Custom Artwork! This TV Stand For 40" LCD TVs Can Go to Your Company's Next Promotional Event! TVStandsOnly.com Is Your Online Source! Trade show display includes large banner stands with custom graphics. Portable truss display has 8' of counter space for displaying many items. TV stand can hold (2) up to a 50" plasma or LCD TVs weighing up to 80 lbs. each. A TV stand for 40" LCD TVs is perfect for creating an intriguing booth that is sure to make passersby stop and check out your company. 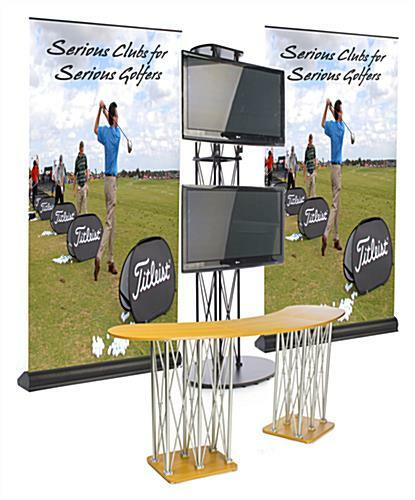 This exhibit display, TV stand includes (2) tall banner stands that feature custom graphics from your business. These banner stands have a 5' x 10' graphic that can be seen across the room. A TV stand is portable, with a carrying bag to hold this custom banner display. The banner stand features a retractable 13 oz. vinyl banner, as well as a collapsible pole to easily set up your TV stand. Whether you own a Samsung, Sony Bravia, or other make, this TV stand is perfect for it! A TV stand, like a trade show booth and a trade show exhibit, has a truss counter display that has 8' of counter space. A large counter is perfect for displaying merchandise or additional information, while also being able to service multiple people at once. The trade show exhibit, TV stand includes a hard shell case for transporting your display that also be utilized as a display counter. A TV stand also features a TV stand that can hold up to a 50" plasma or LCD television that weighs less than 80 lbs. We offer this TV stand with carrying bags to make transport to and from event easily. A portable booth is a great way to leave a lasting impression on your customers! 96.0" x 38.0" x 19.8"
39.5" x 123.0" x 31.5"
59.5" x 120.0" x 9.5"